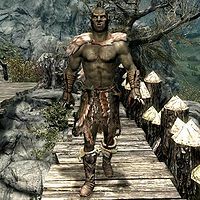 Nagrub is an Orc ranger and the son of Chief Burguk, the leader of Orc Stronghold Dushnikh Yal southeast of Markarth. Nagrub's mother, Arob, is the hunts-wife of Burguk and, as such, patrols back and forth the hold all day and night. Nagrub has no other choice but to follow her example, so mother and son spend their entire existence wandering back and forth the courtyard, at times scouting for enemies in the surrounding wilderness. He wears fur armor, hide boots, and a set of Stormcloak officer bracers. He never sleeps but still carries the key to Burguk's Longhouse. He wields leveled weapons; at level 1 he uses a steel war axe and a hunting bow; at level 6 he uses an Orcish war axe and an Orcish bow. He carries at least twenty leveled arrows, along with a selection of middle-class items and gold. When approached he will briefly introduce himself and his connection with his mother: "I help my mother Arob with the hunt. We bring much meat and skins to the stronghold." He will also tell you about his brother Umurn and the strange traditions they live by: "Brother Umurn is a strong warrior. I look forward to fighting him for chiefdom one day." and "One day, I intend to be chief. I will fight my father and my brother for it, as is tradition."